Although the nation’s students are graduating from high school at a higher rate than ever before, Oregon’s graduation rate remains among the lowest in the U.S., according to data released Tuesday by the U.S. Department of Education’s National Center for Education Statistics. The nation’s high school graduation rate hit 82 percent for 2013-14, the highest level since states adopted a new, uniform way of tracking graduation rates five years ago. Oregon’s graduation rate is, on average, 72 percent of four-year cohorts. Salem-Keizer School District is at the state average. 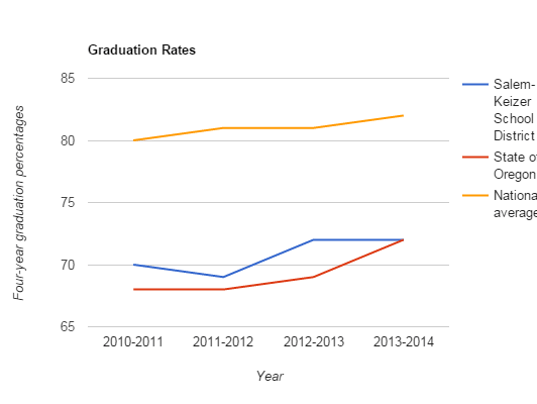 However, in the most recently recorded data for 2014 graduates, Oregon included modified diplomas, or diplomas earned by people with modified graduation requirements. Other states did not all include such data, said Kelly Carlisle, assistant superintendent for the district. Carlisle said the district is working to increase its numbers. “Everyone is interested in seeing graduation rates improve,” he said. He said the finalized data for 2015 graduates will be released in the coming weeks, but these numbers give the district an idea of what they are dealing with. providing students with more academically rigorous classes, should they want them. The district is finding ways to help high school students in the summer so they graduate closer to the four-year goal, Carlisle said. Delegated Deputy Secretary John King said it is encouraging to see the national graduation rate on the rise. The Department of Education has invested more than $1.5 billion in early learning, implemented strategies that improve achievement and close opportunity gaps, and awarded billions of dollars through such grant programs as Race to the Top, Investing in Innovation, and School Improvement Grants, and expanded college access and affordability for families.